Structural Analysis of Historical Constructions. 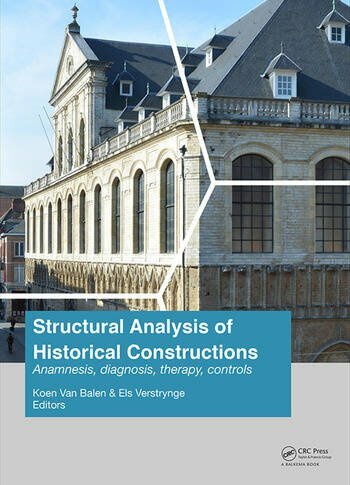 Anamnesis, diagnosis, therapy, controls contains the papers presented at the 10th International Conference on Structural Analysis of Historical Constructions (SAHC2016, Leuven, Belgium, 13-15 September 2016). The main theme of the book is “Anamnesis, Diagnosis, Therapy, Controls”, which emphasizes the importance of all steps of a restoration process in order to obtain a thorough understanding of the structural behaviour of built cultural heritage. The contributions cover every aspect of the structural analysis of historical constructions, such as material characterization, structural modelling, static and dynamic monitoring, non-destructive techniques for on-site investigation, seismic behaviour, rehabilitation, traditional and innovative repair techniques, and case studies. The knowledge, insights and ideas in Structural Analysis of Historical Constructions. Anamnesis, diagnosis, therapy, controls make this book of abstracts and the corresponding, digital full-colour conference proceedings containing the full papers must-have literature for researchers and practitioners involved in the structural analysis of historical constructions. How do brick microstructural and mechanical properties affect GFRP bond strength? Vaulting churches in China: True gothic or imitation? When can we claim to know and be able to assess the structures of an ancient building? Koenraad Van Balen is full professor in construction materials at the KU Leuven, director of the Raymond Lemaire International Center for Conservation (RLICC) and holder of the Unesco chair on preventive conservation, monitoring and maintenance of monuments and sites (PRECOM3OS). He was the first Secretary-General of the International Scientific ICOMOS Committee on Structures (ISCARSAH). He has numerous publications and managed different research projects dealing with heritage preservation, ancient and new sustainable construction materials and is actively involved in research strategies on Cultural Heritage at European level.